My latest fascination in the photography world has to be toy photography. Not just any toy photography either, I love seeing it mixed with other elements and effects to create a sense of realism to the project. Felix Hernandez of Hernandez Dreamphography is one person in particular that has me in awe. Recently Hernandez shared with us his behind the scenes video and photos on his "Inner Trip" project. Just watching the video you can see how much effort is put into his work, more specifically how much is put into the project before he even grabs the camera. 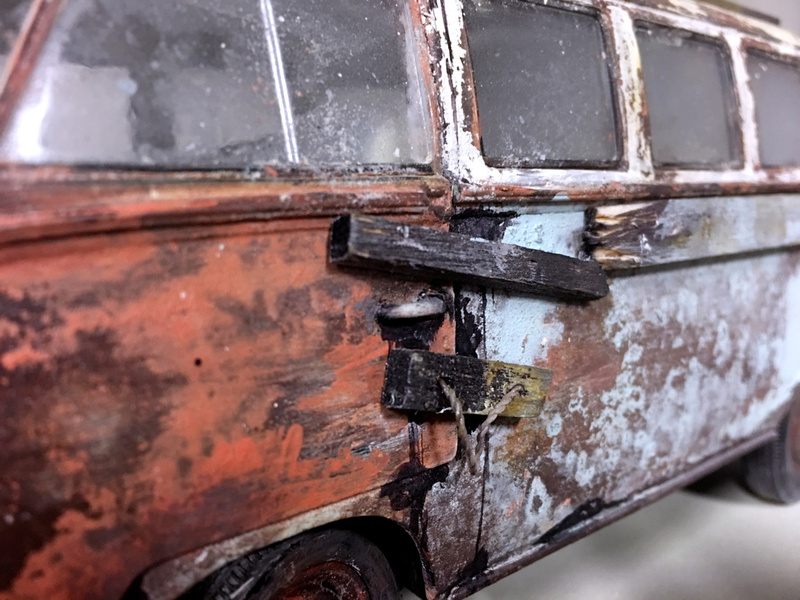 Seeing the scale model of the new VW Bus turned into a rusted vehicle that’s falling apart is art in itself. Lots of time and skill is definitely is put into making his vision into reality. The subject in it's original state. It doesn’t just end with the transformation of the scale model, but then there’s the entire environment for the scene. Reviewing his work and the behind the scene photos definitely has the wheel spinning in my brain, just not sure when I will be able to put forth the time to pull something like this off. This will be one of my goals for 2017, hopefully I will be able to execute it as well as Hernandez does in his body of work. 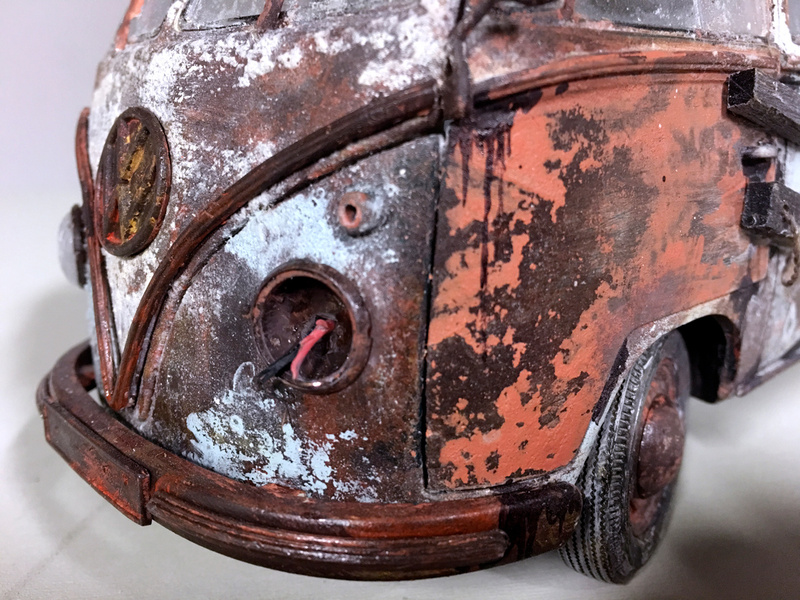 For Hernandez, toy photography isn't much different from other kinds of photography, but it does have its own particularities due to shooting the subject's size. He also loves to use photography in a way that show not what exists in front of the camera, but what exist in himself. For the "Inner Trip" project, it was an extension of what exists inside him, this was a journey into his inner self. These kind of images are what appears regularly in his dreams, repeatedly enough so that he brings them into reality. Why, this is his way of auto-analysis and sharing his world with the rest of us. Nothing extraordinary but the extraordinary power that represent bringing your dreams to life. And nothing complicated, just a little of imagination, patience, and in this case a small source of light. Why does Hernandez chose to shot with scale models? It all comes down to his creative process, shooting with scale models gives him a lot of flexibility in his projects. 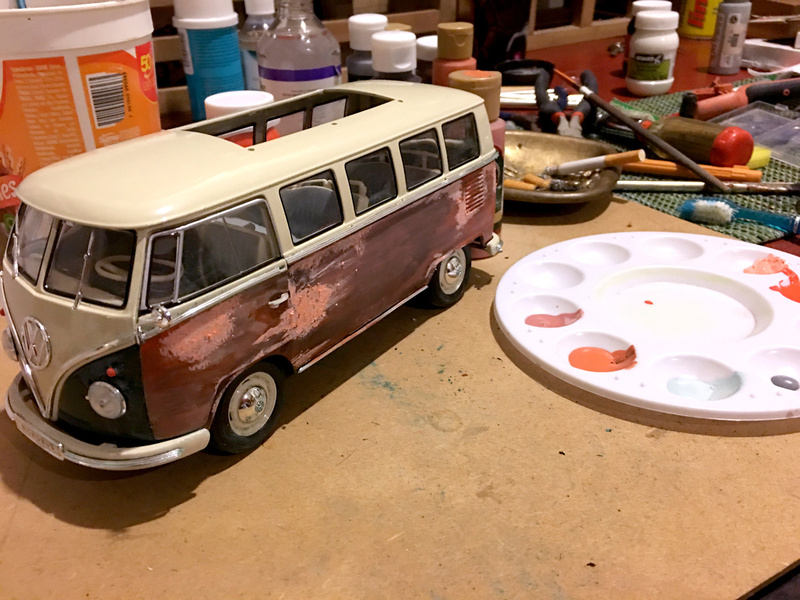 He can transform the scale models as he sees fit, which in this project he turned a new VW Bus into an older rusted broken down mess. Once he's done with his transformations, he can bring them into studio or on location, whatever the vision is he can bring the subjects on location or create the environment by building small dioramas and digital art. 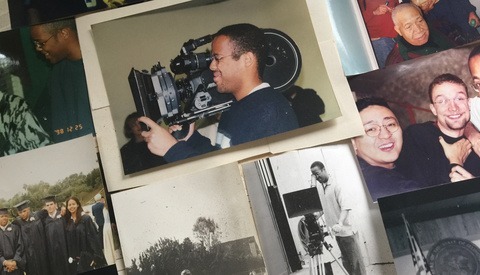 With a mix of on-camera effects and and all his hard work, his ideas and dream comes to life. You don't need tons of gear to tell stories. In fact, you just need a camera, a tripod, a lantern, and yes, some imagination. When asked what advice he has for others whom wish to dive into toy photography, he says there are some subjects that must be taken into consideration: scale, lights, scene, and postproduction. In Hernandez's eyes, this is the most important out of the other subjects. In order to give the sense of "realism" to the scaled models, in most cases you will need in to get close with your camera. You would think it's easy as attaching your macro lens to the camera. It's not. The problem lies with the shallow depth of field the macro lens will produce. Since a small area of your subject will be in focus, the rest of the scene would be blurry. This isn't exactly what you want since we are accustom to seeing things in our human scale, our brain doesn't perceive it as looking real. That would the be the downfall of using macro lenses in this purpose but you could still use the lens to achieve complete focus for the subject by using focus stacking method. "Focus stacking" is a technique used to increase your depth of field with postproduction. Make sure to use a tripod for this method. You want to take multiple photos of the subject while changing your focus point, usually from the first plane, or closest part, to the back plane of the subject. Once you are done, you will have several individual photos that you will take into Photoshop to process and merge them into one, resulting in the final image with the entire subject in focus. Focus stacking can be done with any king of lens, it doesn't necessarily have to be with a macro lens. Here are some important notes for scale from Hernandez. When the scene is wide enough, using a macro lens won't do much good. He recommends to use a wide-angle lens. Hernandez normally uses a Canon 24-105mm lens. The focal length that is chosen depends of the scene and composition for the project. For a lot of Hernandez's projects, he likes to work in studio with his strobes. He says it's similar but not quite the same as shooting products, mostly because he wants to give a sense or realism so you have to alter your thinking to the project's scale. Shooting a real human with an octabox wouldn't be the same as shooting a scaled model with the same light set up due to its size. 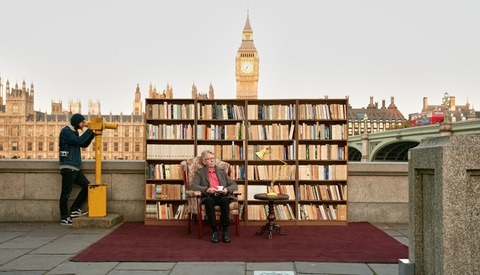 The quality of light would be much softer due to the subjects relation to distance and size of the light source. Take all the basics of lighting in studio to a smaller scale when shooting toy photography. 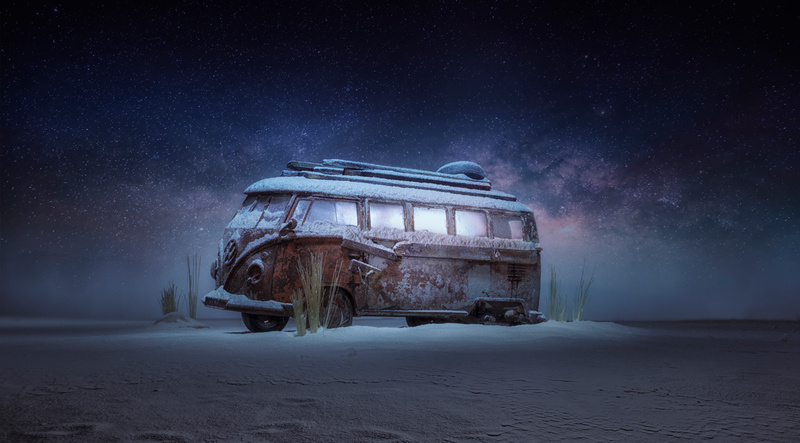 Instead of using his usual light studio set up, he decided to go a different route and use the light painting technique to for the VW bus. With the camera set for long exposure, the one minute shot was lit with a small LED lantern to paint the scene. I love photo manipulation and digital art... But what is really cool, is to do all you can in camera. It is not only fun, it also gives the image a more realistic look. Depending on what type of scene you want for your model, use your imagination and create it. Hernandez uses wheat flour to create his snowy landscapes and switches to corn flour to create the hot desert scenes. Adding some smoke for some atmosphere effects, there's a few different ways you can do this. Hernandez uses the smoke from a cigarette as he found that is the best way to control small amounts of smoke and put there where you want it. You don't have to smoke the cigarette he stated. To create your rainy day, just use a spray bottle with water. To create the droplets he uses corn syrup instead, and sometimes he uses butane gas to freeze things. He does warn us not to use butane gas with cigarette at the same time as butane gas is strongly flammable. If you vape or have a friend that does, you can invite them over to create your smoky or foggy scenes, as that is what I have done in the past. The possibilities are endless and there is no recipe, only use your imagination and try different things. Most of the things you will need are at home or at the corner of your superstore. Be creative. Postproduction is the last subject you must consider and will give the image the final pop. Using photo editing software you can color grade your work to give it the mood you wish to accomplish. Take it a step further with photo manipulation, you can insert images to your background or add elements that complement your storytelling. Enhance your work with some effects that could be too complex to do in camera or even add some blur for a sense of motion. Even though Hernandez tends to try to capture as much as possible in camera, there are some things that have to be done digitally. At the end of the day, toy photography is just a mixture of playing and bringing your imagination to life with technical photography aspects combined. 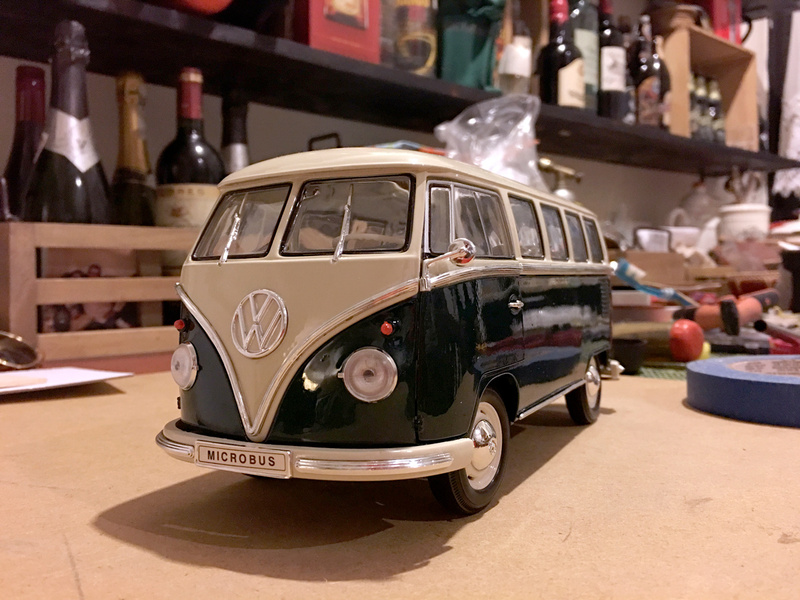 The technical side can be learn and it's "easy" but the "hardest" part of toy photography lies in our minds and in our hearts, and that is staying childish, foolish, dreamy... Learn how to play again. If you have forgotten how to... just spend some time with your boys... If you don't have boys, then grab some memories when you were one! All photos used with permission of Felix Hernandez. Hi Tony... Thank you. Glad you like it. Fantastic work, the guy is an accomplished artist beyond shooting however. Hi Spy (black)... 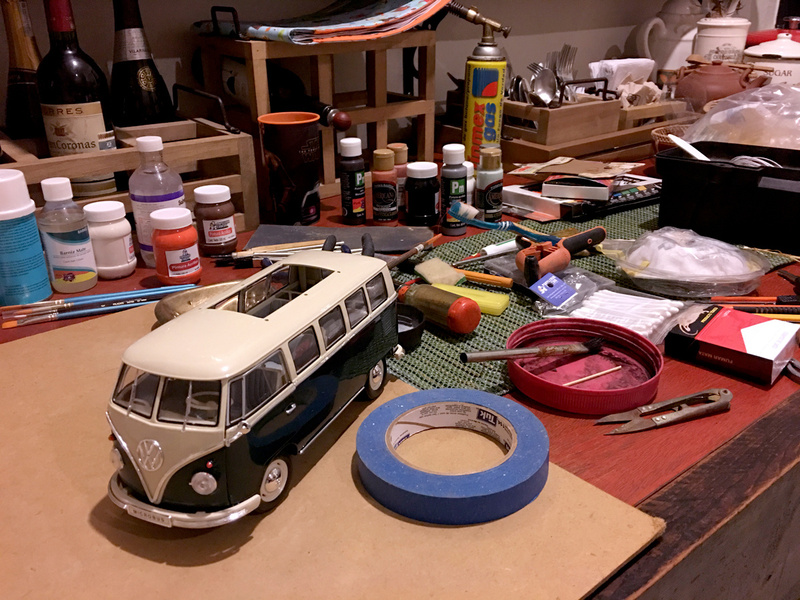 Thank you mate, One of the things I most enjoy is working on the scale models and preparing the scene!... I don't know if that could be considered as art, but for sure is fun!... Saludos. Felix always blows me away with his work. All of it is amazing. Hi Steve... Thanks you man for your words!!! I really appreciate them. I"m working in new stuff that I hope you will like as other in the past. Hugs man. Félix muchas felicidades! Que gran trabajo! Felix, so exciting to finally get to meet you in your upcoming workshop in NYC! Can't wait!